Negotiating with my girlfriend the night before the morning of the 12th, a combined force of Kyle, myself, and some of her friends from work were able to convince her to let me go digging a third consecutive day, instead of seeing her for two consecutive ones. With the go from her, I was ecstatic all that night, and undoubtedly dreamed of pulling amber quart blobs and ginger beers from the ground. The next morning, I rose in my residence and drove to Strathroy, as usual, for a 6th day of digging the Old Soda Works site - and despite my growing familiarity with the geography of the area, my boredom of it did not even begin to manifest. Besides, the geography was rapidly changing - several holes large enough to fit a small Volkswagen into having been opened in the backyard and between the two properties. I arrived at Kyle's house to pick him up fairly late in the morning, around 10 AM, and we drove directly to the site to open up some more holes. 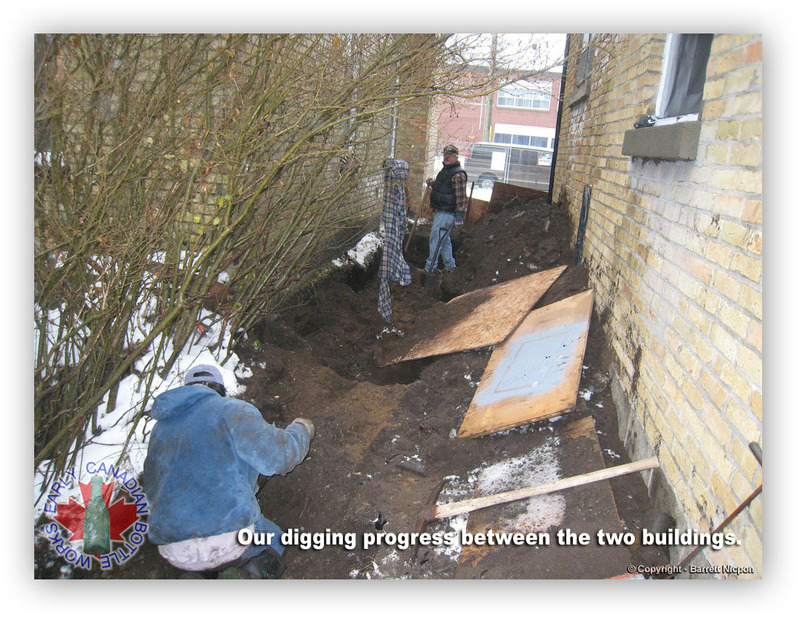 As soon as we arrived, dodging what of the fence surrounding the premises had been erected, I immediately laid claim to the hole my father had been digging in the day before, and Kyle continued working in his hole from the day before. Jim arrived very briefly, and wondered about whether or not my Dad would be showing up. I speculated that he wouldn't as the lengthy period of time he spent digging the day before had probably tired him out, especially fending off the pain of an injured wrist from earlier this year. More ginger beer shards emerged from the ground, with an especially high concentration (comparatively to other areas in the yard) of FARR & SHARPE ginger beer shards, but nothing large enough to be repaired. More quart and pint Taylor and G.E. Murdock bases, as well as some additional shards from the rare & elusive blue Murdoch seltzer, including one shard showing the left part of the acid etch, and proving for the first time that George Murdoch's name was spelt "GEO.E.MURDOCH" on the vibrant blue glass, instead of just his first initial, as on all of his other bottles. I was still working in an area of pure shards, nearly unable to dig. Beneath that layer, however, lay one of pure ash and brick, with the occasional ginger beer shard being all that could be found. Kyle was digging in more sandy soil, with a much lower concentration of shards, but low shard areas such as this had been where many of the close to intact, or intact bottles, had been found previously, so he stuck to it. Almost immediately after shovelling some dirt out of the hole, and opening the sides up a bit, I hit the face of a J. Tune quart gently with the end of my shovel. The soil was, again, unusually sandy in this area, which probably accounted for the presence of a miraculous three intact Tune quarts, rather than them being broken as was the case with every other bottle. Sure enough, the bottle emerged after gently tugging it free from the lose sand, and it was absolutely mint, although very badly mineral damaged. 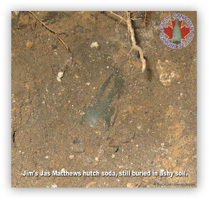 Jim shortly afterwards reported that what appeared to be an intact hutch soda had appeared in a very deep layer of ashy soil in his hole. I ran over to take a photo, and just before he pulled it free, a "JAS MATTHEWS / TORONTO ONT" hutch saw a camera flash for the first time in its existence. 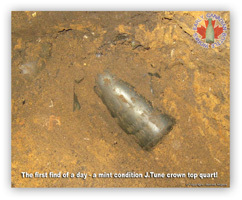 One small lip chip from mint, and although perhaps a common bottle, one that neither Kyle nor I had ever dug in any condition. 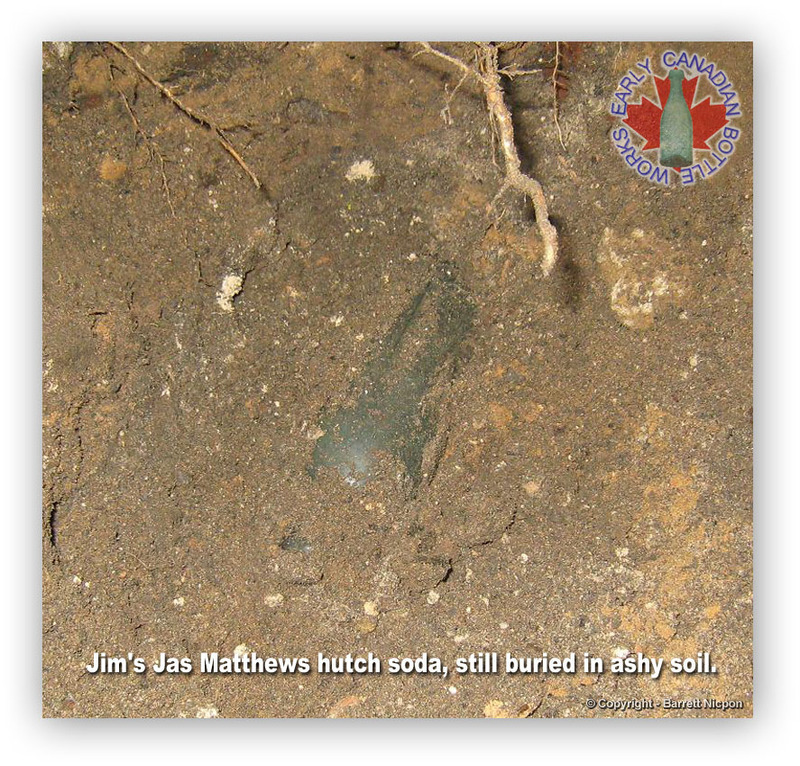 We were impressed that so many intact bottles were emerging now compared to at any point previously in the dig! And then, something beautiful to my eyes occurred. My father wandered up along the front of the driveway, dressed in dirty jeans and a plaid jacket, ready to dig, and asked "How's it going, boys?" I believe I felt a tear come to my eye at that moment, as I knew that my father had become a bottle digger. He continued to widen the hole Kyle had started the day before, closer to the backyard of the property, and right next to where Jim was digging. I offered his hole from the day before back, but he had no interest in it, so I continued to work. Digging towards the backyard, I had a few false alarms, as intact emerald green J. TUNE quarts suddenly turned into unembossed english soda bottles with their tops knocked off. The couple quarts that did appear to be intact wound up being J.TUNE or R.TAYLOR pieces with the very tops knocked off. Kyle maintained that nothing was to be had where he was, as not a shard had emerged in over 20 minutes of digging, and Jim lamented in a similar plight, as his deep layer of pure shards had begun to disappear. My Dad hadn't found anything yet. 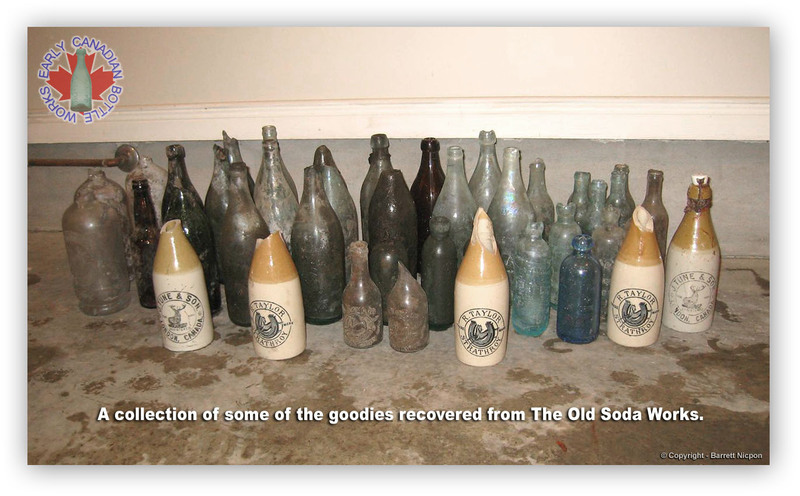 Could we have nearly exhausted the Old Soda Works once and for all? I for one hoped not - it had been such an incredible experience! All 4 of us were in a spell of pure non-luck. I decided to dig the opposite direction in my hole, and began encountering shards almost immediately, right up to the edge of the sidewalk. Clearing more dirt out of the hole, I was pleased to pull out a vertical shard of an R. Taylor ginger beer amounting to almost half the bottle, from deep down within the ashy layer Jim had found his Jas Matthews hutch in. Continuing to tunnel into the side of the hole, I encountered a base with a large, upper case "M" on it, jutting an inch out of the edge. It was visibly empty - no dirt inside, but also visible broken, as a large crack cut directly across it. However, working my way around it's edges, I pulled free the closest to intact example of a G.E.MURDOCK crown top quart I had yet - only cracked into 3 pieces, but all there... except for the top being knocked off. Still, a better specimen than the nothing I had to fill its space previously! Perhaps things were looking up? Just as this thought entered my head, Kyle announced that he had begun to find shards again, and just seconds later continued his announcement, before he had even ended the sentence, by saying that he had what appeared to be the base from a pint crown top or hutch in the edge of the hole. He could see letters on the base, but couldn't read them yet. He dug the bottle out, and sure enough - the 4th intact hutch soda we had dug out of this dump (literally!) appeared - this one more local than the others. FARR & SHARPE / TRADE MARK / SARNIA the aqua glass read in a blaze of historical glory, with an awesome insignia of intertwined initials to accompany it. A match to the amber quart blob, and the couple broken ginger beers we had recovered, this piece would make a nice addition to Kyle's collection! Shortly after Kyle pulled that piece out, our two excavations reached critical area, and the boundaries suddenly melded, leaving us with one huge hole, and nowhere else to dig. Kyle decided to meander and look for other areas to dig - such as in the back corner of the lot. My father moved down to where Kyle had been digging, as the hole him and Jim were sharing had become very cramped, and I began to dig away from the road again, hoping for some thing. By now, Jim had had enough of the pure sand and ash he had been encountering for the past 20 minutes, and began to dig a different direction. Only minutes after beginning the journey through the dirt in the direction of Jim and my Dad's excavations, I encountered the rounded base of what was obviously an ontario quart soda, with a large 'K' embossed upon it. My heart began pounding, as this piece appeared to be nearly empty, as well - perhaps more than just a base? As I gently removed the dirt around it, a nearly intact "BABY & HANRAHAN / WINDSOR" hutch fell out of the dirt surrounding the bottle - broken off just below the lip, and still with the stopper laying inside it. But now the K-based quart soda was of the utmost interest. I continued to work on the bottle, and as I gently tugged it free, noticed the beautiful blob top in seemingly mint condition, and rubbed the embossing clean for the first time... my heart almost stopped. "J.H.KILLER / STRATHROY / ONT." it read... or so I though. I was about to ask what was happening, and how there could be another soda maker from Strathroy that we didn't know about, when I took a second look - "J.H.KILLER / TRADE MARK / STRATFORD / ONT" it actually read, and my heart calmed a bit. 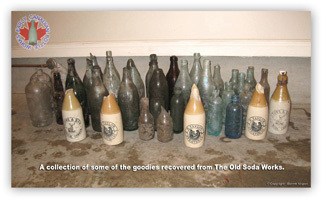 I had still recovered yet another intact blob quart soda, and was very happy! I called for every one, and Jim indicated that he had seen the piece, and that it was, indeed, a "Killer bottle" - we all chuckled. The original cork clasp still attached to the neck, this was a beautiful bottle indeed! Recovering another couple shards from R. Taylor ginger beers, and digging down and around to verify nothing was left, Jim's excavation melded into mine, and suddenly we had all collectively dug one enormous trench - over 25' in length, and 5' in width. And what a trench it was. 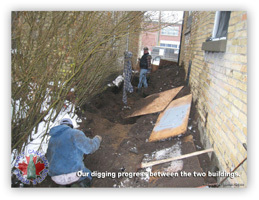 Kyle came back from the corner with nothing, despite having dug a fairly impressive hole, and we decided to venture over to the north side of the house, where the current laneway resided, and see if anything would turn up there, as it did on the south side. Jim & my Father stayed where they were, and continued to dig. Breaking through the frost on the north side where we hadn't dug proved most difficult, and when we finally did, we were both rewarded with shards of none other than R. Taylor ginger beers! Kyle uncovered a base, and proceeded to pull out a crown topped R. Taylor pint with half of the base frost popped out of it. I dug towards the road, and stopped dead in my tracks after taking one particular shovel full of bright orange, sandy soil out of the hole. There, jutting into the edge of the hole, was a ginger beer bottle - matching the profile of the R. Taylors perfectly. it was visible to just below the tan line, and all the way down its sides. Still with the stopper in place, it looked dead mint, and I was about to throw a fit, when I decided to not let it get the better of me, and pull it free to see if it was the prize I was hoping for. I gently tugged the bottle's neck... no movement... it felt solid. I continued to dig, and as I pried the soil up from beneath... the severed shoulder of an R.Taylor ginger beer fell onto the blade of my shovel. Broken off right below the tan line, and not cleanly, either. Oh well, at least we had another nice R. Taylor stopper. We decided to call it quits shortly after that, and all of us (save my father, who was very understandably tired) went to Jim's house for a beer, and to take photos of the booty from the previous three days of digging. The Soda Works was done, it appeared - whatever was left would have to wait until the heavy machinery moved in and opened up the ground for us. When the whole group of bottles was rounded up in the garage at Jim's place (sans my amber blob and my repairable specimen R. Taylor ginger beer), we all stood around laughing, joking, telling stories, and discussing the prospects for future digs come the spring, in and around London - so much to be done, so little time! We had dug a once in a lifetime dig, and I doubt any of us would ever forget it. I, for one, had made a new good friend, Jim Butler, who will undoubtedly complete the trio of diggers alongside Kyle & I in the future, and we had all recovered a few beautiful bottles from certain destruction through digging through large quantities of dirt, and suffering through the overbearingly small (oxymoron?) number of intact bottles throughout the mess of broken ones. And we were all ready to do it again some time... hopefully at another soda works. Although this is obviously deemed unlikely - what kind of unlikely scenario ever stopped us?